The bar crossing out of Astoria was uneventful and the bar was benign, which was good, we didn’t need additional adrenaline pumping on the initial start of our passage. We hoped to fish for tuna about 25 miles offshore, it’s been a fantastic run so far and everybody has been catching their limit. We didn’t have any bites on the cedar plug, it just skipped across the surface reminding us of our inexperience. Sorry Woodhouse – you should’ve kept the gear for yourself. 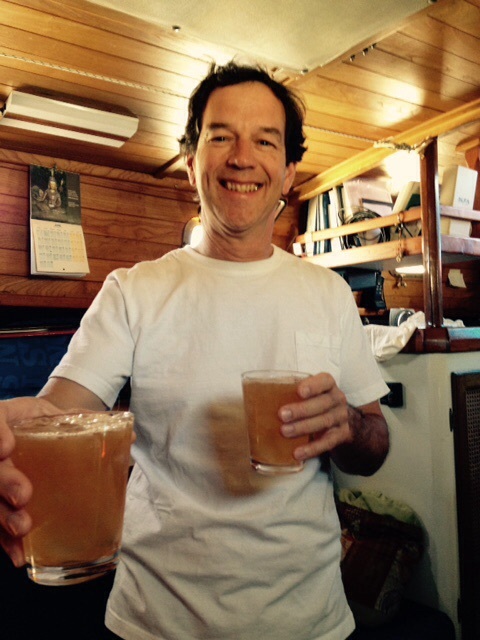 We motored through the first 7 1/2 hours in mostly calm wind and waves, but with large comfortable swells. 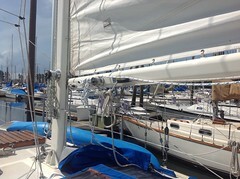 The wind later picked up to a fresh breeze from the west, we shut down and hoisted all sails. We quickly sped up to 6.8 kts under full sail, it was great to have Konami moving as fast as she could with all the extra gear and weight. She was in her element. It was a glorious beam reach sail for the first hour. From there the seas drastically changed due to a prior low pressure system that moved in during the night and early morning. By dinner time the sail became very uncomfortable with confused wind waves and swell coming first from South-southwest, West and the clocking wind to the Northwest, cross swells. And the wind waves and large cross swells continued to build…. The boat started rolling from side to side and pitching up and down through the wind waves, figure eights and sliding in the cockpit wasn’t fun any longer. The snapping sails and banging rigging was worse, the entire boat rattled and clanged, reverberating throughout the interior, neither of us got any sleep on our offwatch. We headed up to a close haul (pointing the boat and sails toward the wind) sending us further offshore figuring we would make a long straight line back into Coos Bay when we arrived west of the bar. The ride smoothed out just enough for us to regain our balance and senses. Calculating the point of sail and distance we knew we had best jibe (reposition the sails to opposite side of the boat) back towards shore if we were going to make the tide change and bar crossing on time, which began the dreaded downwind rolling. 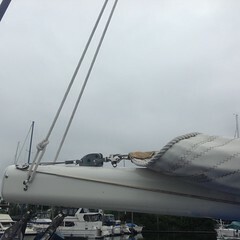 We tried to sail about 20 degrees off the dead downwind to minimize the roll, nothing helped. First a large swell capped with a four foot wind wave from the west lifted us up and we surfed gently down. The next swell rose up and just when we thought we would surf down the backside, a mean cross northwest sneaker swell took over and shoved us off the side rolling us onto our starboard (right) side. Without missing a beat, Konami righted herself and just as we regained our foot hold, the southwest swell with breaking wind wave picked us up and pushed us off onto port (left) side. 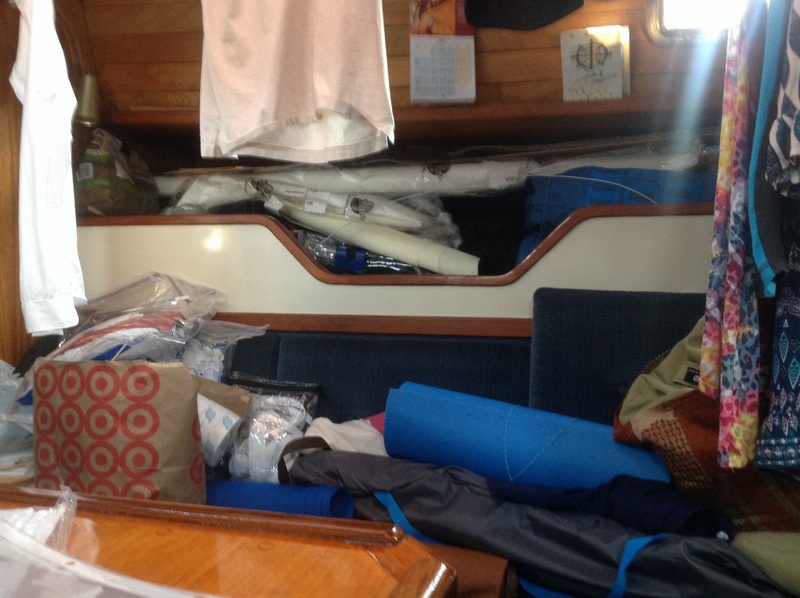 Everything from dishes to gear inside the boat clanged and complained, including us. I thought about the poor little spider that I threw overboard earlier and the retribution I was receiving. On through the night we jibed back and forth across our rhumb line, surfing, rolling and pitching as the wind clocked from Southwest to North-northwest. Thank goodness for the dark night and we couldn’t see what was coming from behind. The sleeping fishing fleet of boats and crew were drifting along anywhere from 1 to 3 kts, setting off the AIS (automated information system) alarm keeping us alert. John and I each got about two hours of sleep. By morning the wind died and the wind waves subsided, sunny and warm, John started the engine. We were about 12 nautical miles abeam the Newport bar when he listened to the updated forecast. The wind waves were forecasted to be 6 – 9 feet, swell 3 feet 9 seconds, winds 20 – 25 knots, gusting 30, small craft advisory beginning in the early afternoon and in effect for the next 72 hours right in the middle of where we were headed. It meant spending another night out in rough conditions. We made the turn in to a welcoming sunny Newport. We watched a whale spouting off the stern, later John saw a whale breach several times about 350 feet from us. His powerful body slammed down sending thudding sounds through the hull of the boat. On the way in to the Newport bar we nearly ran over a basking sun fish, it quickly splashed and escaped just under the water so I got a great view of it. A good six feet long. His or her large partner was also basking 20 feet from the boat. Strange creatures. 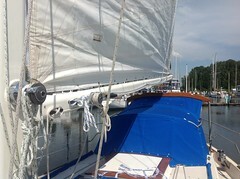 It’s amazing how much attention the Westsail boat receives. 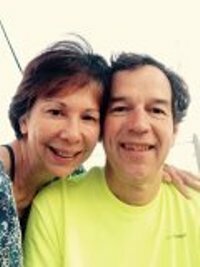 We’ve had several people come up and talk about their experiences with the Westsail or yell from a passing boat that their brother sailed a WS28 to New Zealand. 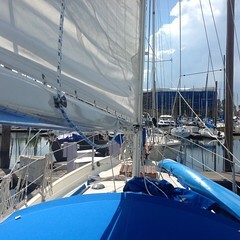 We have people look at our rigging and exclaim how lucky we are to be retired and living the cruising dream. All the rough sailing is forgotten, we pat our boat with pride and gratitude. Terrific friends greeted us on the dock with beer and congrats, offering humor, showers, home cooked dinner and a ride to the store. Woohoo! So Long, Portland. We will miss you! Konami officially left the Portland marina on Sunday July 12th, a fortuitous day according to the Buddhist calendar, Fire Fire day. A good day for wealth and prosperity, most importantly, material support. That is Konami, our support. The last few days in Portland was spent with our sons, grandsons, and a newborn baby. Last hugs for a while, a few tears knowing we won’t be spending time with our families for a while, but also a lot of joy that our cruising journey has started. John worked right up to the last few days before departure so there wasn’t much time to finalize the projects and stow everything in the lockers. 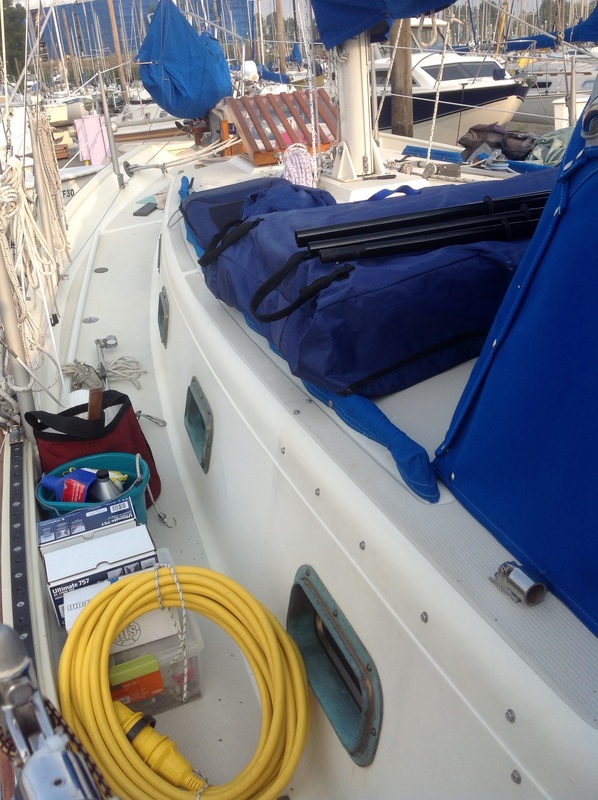 We left with the main salon hatch open and disassembled, boxes of tools and gear spread through out the cabin, head and V-berth. It took 15 minutes each night to shuffle piles from the bed to the settees and back again in the morning to have breakfast. We headed up river to the island that is a wilderness area with a free dock and spent three nights reorganizing the boat, stowed the gear and took time to unwind from the past few chaotic weeks. Most of the time we had the dock to ourselves, the beach was beautiful and calm. Fresh picked blackberry cobbler due to an early season was delicious. Only the train in the far distance could be heard. No more planes flying overhead, no cars, no sirens and no people. It was glorious. Wednesday afternoon was a last drop in at a neighboring marina to pick up provisions (whiskey), last minute gear items, and we called it done. We departed from the marina (a free overnighter from the staff) early Thursday morning just before rush hour under the Interstate bridge. I wanted one last view of Mount Hood, Portland’s own, but she was hidden behind the marine layer. We silently motored out to the railroad bridge and radioed our swing request. A farewell from the railroad bridge with his five toots of the horn and we waved so long to Portland. Our first anchorage was Wallace Island more than half way to Astoria, the last port before the ocean. Nearly 8 hours of fatiguing engine noise and the final outgoing current we decided to anchor. Steep four feet wind chop and 20 kts of headwind was too much. We took wind waves over Konami’s bow, drenching the canopy. The little Cape Horn of the lower Columbia River forced us back up river a quarter of a mile. We actually sailed the short distance practicing unfouling a sheet, a wrapped sail, heavy handed steering and heavy boat wallowing in steep chop. Fun, according to the job scale. We are now securely anchored, albeit still windy with 20 kt gusts. Opposing wind and current makes a swinging anchorage, tide current from one side to the gusting wind broadsiding us from the other. One side of the anchorage is a large power plant that blows steam from seven stacks, not beautiful – a reminder that city life is still close, the other side is the beginning of Crim’s Island, uninhabited and remote. Turkey vultures by the dozen fly in gaggles, a bald eagle springs up from the roost to protect the nest. Desolation with a great view of the Columbia river, it’s warm and the wind sends wavelets to lap at Konami’s bow. We’re on “schedule” for leaving Portland. Most cruisers know there is no real schedule when planning for a passage. Too many variables. Our short term plan was to leave Portland and take a couple or three weeks on the Columbia River to complete a shakedown of our new systems and storm sails, figure out how long we can comfortably live on 125 gallons of water, limited fresh food and washing clothes by hand. But most importantly, just unwind and play with our toys. If all the electronics, engine and gear were working then we would head offshore earlier, stopping in various ports along the Oregon coast. We still have a bottom paint haul out scheduled where we will spend a couple of weeks with my parents. Last chance to visit our families before moving on down to California. Final push to get out of the storage unit took a bit longer. We used the time and space to finish up some boat projects. 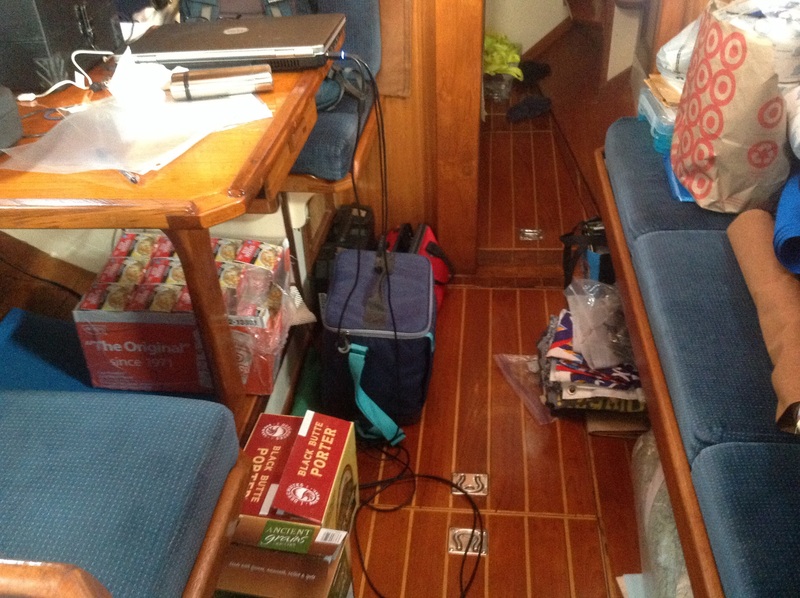 Large canvas projects, rebuild the V berth hatch with all new wood and acrylic, put in extra shelving within the large cubby holes, but in general we discovered the major downsizing we did earlier wasn’t enough. More loads to the goodwill, and begging family and friends to take our “gifts”. Loading the boat was easy, just stack bins , bags and boxes on deck, on the bed, table and any other place where it would fit. The cockpit was so full we could barely get in through the cabin doors. Reality set in like buckets of cold water in our sleeping faces! We stumbled around, shuffled stacks of clothes, food, toilet paper, gear and spare parts from one end of the boat to the other. Seriously. Our boat neighbors watched in disbelief. We were in disbelief. The waterline came up about 3 inches, that is approximately 2700 pounds of additional weight. Slow boat to China, it was time for a serious boat diet! We are now down to manageable piles of gear, we can see parts of the cabin sole and some table space. The soft cooler doesn’t need to be stored in front of the head (toilet for non boaters), it actually sits under the table for now. I have bruises, a sore tweaked knee, John lost some hairs on one project, but we’re doing okay. Best of all, we can crawl into bed without spending 15 mintes rearranging the piles. The loose ends – tasks that eat time and we didn’t get done the last couple of months that should’ve been accounted for. Selling the cars, last minute retirement paperwork, reassessing the nonessentials weighing the boat down, and small annoyances. I see light in the boat. 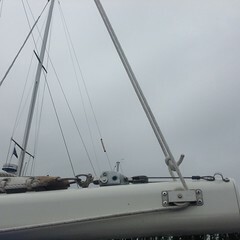 The hatch above the salon needed new acrylic so we decided to replace it when we picked up the V berth piece. We have it torn apart sitting on the forepeak, and since it’s been unusally hot in Portland it works well to have a large open hole in ceiling, we may just leave it for a couple more weeks as we move down the river, all play and no work doesn’t feel right. Waiting for little guys. 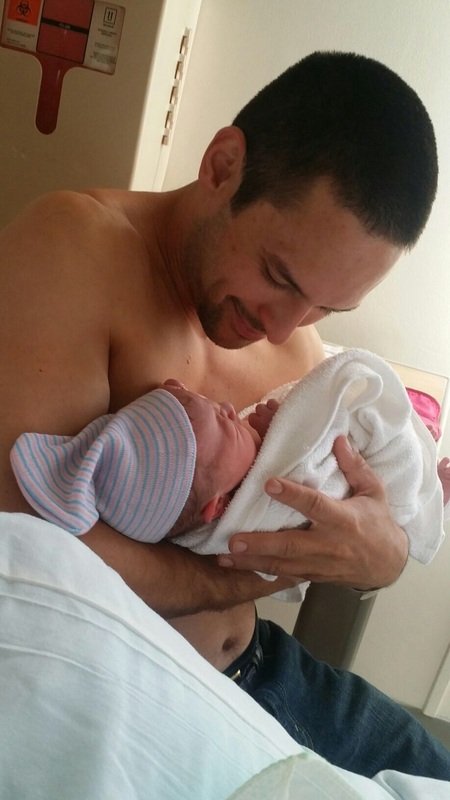 No Name Baby finally arrived after 54 hours of labor and waiting, waiting for text updates, the little guy popped out. Relieved that all is well with Mom and baby, we’re waiting for the parents’ bonding time before we visit. In addition, we have another grandson’s first birthday party to attend this weekend, and another grandson’s second birthday is next week. Where did all these kids come from, it’s like watching Mr. Smith in the Matrix series duplicate himself. 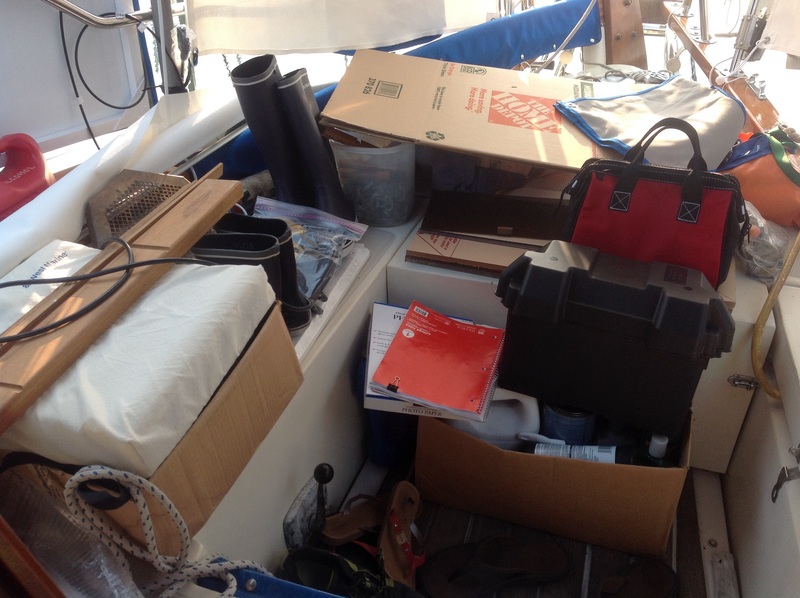 We can get back to reorganizing, selling cars, finding the essentials that were crammed into the lockers without noting it properly in the boat journal (the one that was suppose to have been started a while back). Retirement: The feeling of relief, time to sit and enjoy the morning coffee, no rushing to the job. Hanging Out: Life is wonderful. We love and we are loved. 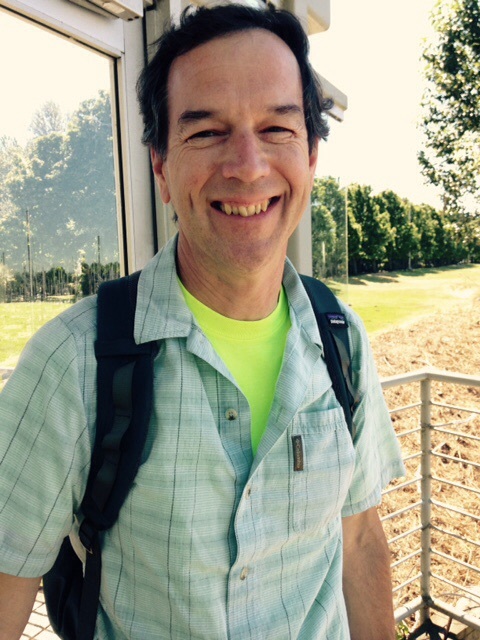 John’s Last Working Day… Unbelievably Amazing! The joy of retirement, the end of awful commutes and getting up to the blaring 4:20 a.m alarm. A toast to us, whiskey sours, a Konami specialty to celebrate the long anticipated occasion. Job well done, Baby. AND Happy Anniversary! 19 years ago today we committed to exploring new paths together, and continue with our adventures as we set sail in just a few short days.